Have you met Renee of Kudos Kitchen before? Maybe you remember Renee as a cookie maker (and University of Cookie professor), creating the most beautiful PAINTED cookies. But earlier this year, Renee hung up her apron and started making art that wouldn't be, well, eaten. *squee* Can you believe she recreated my blog header?!? Well, Renee was kind enough to offer one of her holiday tiles to one of you!!! Whether for your own kitchen, or for a friend (Christmas is right around the corner, you know), you are going to be amazed by Renee's talent! She truly does have a gift. Winner will be selected, Tuesday, November 9th at 8pm CST. Good Luck! Love the Let it Snow tile!!! SO cute! I looove those tiles. So cute and she is wicked talented. Personally I am a huge Halloween lover so the Witch Moon is my favorite! I love the Cardinal. Great for after teh holidays too! My favorite is the Christmas Kitchen Baker. So cute! Okay, having a hard time choosing! I love the Christmas kitchen baker. Love it. Loving the Let it Snow tile or the Christmas Kitchen Baker! So cute! I love the poinsetta tile, the christmas cookies tile, and the cardinal tile. Let it snow one! SUPER CUTE! The Let is Snow, Man! tile is adorable!! Love the sparkle poinsettia! What a great job she did on your tile :) to pretty! Let it snow, man is my favorite one. They are all so cute though. I love Thanksgiving Blessings because the pie is in front of the turkey! But the Winter Cardinal is lovely as well! Thanks for the insight into royal icing versus glaze icing, by the way. these are so cute! love the "let it snow" one and the "christmas kitchen baker!" i love the cardinal tile! I absolutely LOVE the Let it Snow tile. I love how the little snowflake it right on top of the cute snowman carrot nose! I absolutely LOVE the Let it Snow tile. So cute how the little snowflake is right on top of the cute little snowman carrot nose! I'm lving the Winter Cardinal tile. It was my grandma's favorite bird and my husband's partial to it, too, since he's from Indiana. I love the Christmas Baker tile! So talented!!! I love the Thanksgiving Blessings. The Sparkle Poinsettia Tile is beautiful. I love the Cardinal and Let it Snow ones too! I hope I win! The drawing is on my birthday!! I love the Sparkly Poinsettia one!! Beautiful work! WOW - Renee is super super talented. I have so many "things" in my kitchen and don't have any trivets. I'm taking this as a sign that even if I don't win, I have to get one of these for myself. Bad to the Bone!!! Actually I love them all but I know my son would get a huge kick out of the bad to the bone tile. He is crazy about skeletons right now and I'm always telling him that he is bad to the bone so when I saw that tile it totally cracked me up! I LOVE LOVE LOVE the Christmas Baker tile of course! I would say the Christmas Kitchen Baker! wow, whata great job. I fell in love with the Let it snowman and the one she made for sweetopia. Adorable! I like the Christmas Kitchen Baker but the French Waiter would be a perfect Christmas gift for my mom. love the let it snow tile! So cute! Love the mix of whimsy, classic and quirkiness. That winter cardinal tile would make a lovely gift for my grandma! i Love the sparkly poinsetta! I love the Let It Snow tile! Love the Pilgrim Girl Trivet. Thanksgiving is my absolute favorite holiday! "Thanksgiving Blessings" is my favorite! I love the "let it snow" tile!! Those are adorable! It's so hard to pick a favorite, but I think it'll have to be the North Pole tile. wow I LOVE this! I like the witch a ton, but I would probably pick one out as a gift for my little sis who just moved into a new apartment, so I'm not sure which I would eventually decide on! These are SO CUTE! Christmas Kitchen baker is adorable! Wonderful giveaway! I love all of them, but the Thanksgiving Blessings is my favorite. I love the snow man tile! I collect them, and that would be a great addition. I love the "let it snow" snowman but I also like the cupcake ferris wheel for every day use :) I LOVE to bake and these are very creative!!! I love all of the Halloween tiles-- not sure which is my favorite though! Maybe the witch or the haunted house!!! How pretty! I like all of them but especially LOVE the Let it Snow tile and the North Pole. What a great giveaway! Close runners up: The witch, the haunted house, and the bad to the bones tile. LOVE the Christmas ones, especially the woman making the cookies - how fun! Loving the Christmas Baker!! Super cute! I really like the cardinal one, especially since it's my state's bird! Those tiles are so cute! I love the Christmas Kitchen Baker. I love the Christmas Kitchen Baker and the Let it Snow, MAN! So cute. Oh my goodness. Christmas Kitchen Baker. It made me think of my mother immediately. Let it Snow, Man! is my favorite. They're all cute though. They are all so beautiful how can we pick just one??? But if I had to I like the Christmas Baker best followed closely by the cardinal. What a talent! so cute! my favorite would have to be Christmas Kitchen Baker.. or Let it Snow! I love the Christmas Kitchen Baker!! So Cute!! These would make perfect gifts, too!! I like the Christmas Kitchen Baker. Adorable! The let it snow tile is adorable! It would fit in perfect with our christmas decor! Thanks for the great giveaway! I was just going to pop over there to pick one out quick so I could enter, but I got stuck there! I couldn't stop until I had looked at them all. She is very talented! I like the Let it Snow tile. And we're supposed to be getting the first snow of the season here tomorrow so I might as well celebrate it! The Christmas Baker is so special to me. That is my time to shine. I bake for hours and give it all away. I have enjoyed Renee's blog for a while now and hope to win. I will be putting this on my twitter and facebook too! I love them! I'm torn between Oktoberfest and the north pole! I like the "My Spicy Kitchen" tile. Love the Christmas Kitchen Baker... so adorable!!! I love, love, love the crosswork tile! I love the Christmas Kitchen Baker! So cute. WOW! So cute! I can't decide what one I like best. I like Let it snow, North pole, and both Halloween ones. btw, only a baker would understand my excitement so I thought I would share since my dh just don't get it. My dh bought me a kitchenaid mixer (my request) for my birthday! I'm so excited and have been burning it up with your recipes :) You inspired me to bake more especially with my boys. Its so fun! Yep, christmas Kitchen baker is it for me! I love it and would love to have that scenery to look at while I bake :) Thanks! I LOVE snowmen, so as soon as I saw the "Let it Snow, Man" tile, I knew it would be my favorite! I really liked the "girl pilgrim" but the "Christmas Kitchen Baker" was beyond adorable. She really displays quite a talent! I really like the Thanksgiving Blessings. The corn is even textured! I'm not really much of a drinker, but I love that Oktoberfest tile! They are all amazing, but I definitely would have to go with the Christmas Kitchen Baker! the Winter Cardinal Tile (6x8) is beautiful! Love, love, love Let It Snow, Man! They are all so cute. I guess I would choose the Thanksgiving Blessings. My favorite would have to be the snowman. I love snowmen so much that mine sit out year round. They keep me cool in the summer. So fun! I would love to win this!! The pink cake is my favorite one! The LET IT SNOW has caught my eye. Let It Snow is darling! OH MY GOOODNESS!! Love it. Need want. Okay, want one. I love the Christmas kitchen baker! I love the kitchen christmas baker tile, it's beautiful. I like the Winter Cardinal tile:) Great giveaway! I love the "Let it Snow, Man!" tile. I'm a huge snowman fan! LOVE the Christmas kitchen baker! Such a wonderful picture! I love the Christmas Kitchen Baker tile- so me!! oh the christmas kitchen baker tile is so cute! I like the Christmas Kitchen Baker. She is so talented! My favorite is the winter cardnial!! Christmas Kitchen Baker is my favorite! the holiday cardinal is my absolute favorite! They are all brilliant! I really love the Thanksgiving Blessings - but the Christmas Baker comes in a close second. Such a wonderful talent to have. They are all wonderful but Thanksgiving Blessings and Witch Moon are tied for my favorite. The Thanksgiving Blessings is my favorite ~ and that's saying something because I think they're all just spectcular! I love the haunted house tile! Love the Christmas baker tile! She is very talented! Hope I win!! oh these are amazing. i love the one with the lady baking!! Such cute tiles and so hard to limit it--BUT I love the Christmas Kitchen one! Thanks also for the tip on the Sam's chocolate--it's on my list now! Let it snow, man is so cute! I really like the "red cardinal" - reminds me of my grandmother, but they all beautiful! I think YOUR tile is my favorite--her detail is just amazing. But for me I'd have to say the Let It Snow tile. Super cute! I just LOVE the Thanksgiving Blessings trivet! What a great reminder that we have so many blessings! I LOVE the Thanksgiving Blessings tile! I can't choose between the cardinal and the let it snow, man. Beautiful pieces! They are all so detailed and beautiful!!!! I love the Bad to the bones!!! hysterical! I love the Christmas Kitchen Baker tile! These are such a great gift idea, your tile turned out beautiful! I like the holiday one with snowman and the everyday one with apples. Those tiles are amazing! I would have to say the Christmas Kitchen Baker. 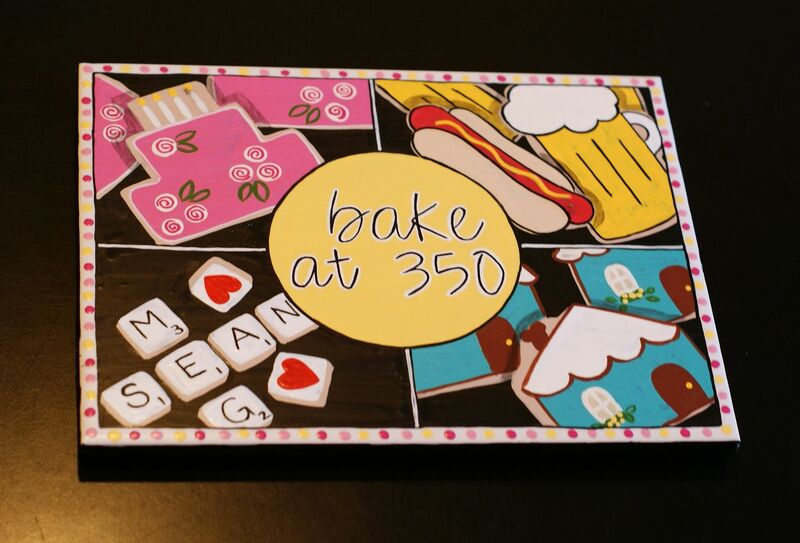 I bake for a living and still love to do it at home :) Such a cute idea! They are all wonderful but since the poinsettia is my favorite flower, I have to go with that one! My favorite is the Winter Cardinal! i LOVE the let is snow tile! That is so cute, with the little snow flakeon his nose! Those tiles are very cute and I love the Let It Snow, Man! tile. Too cute. Oh, they are all so neat! I really like Thanksgiving Blessings. I LOVE these! My favorite is probably the Christmas kitchen since I plan on doing a lot of baking over the holidays! I like the North Pole tile! soooo adorable!! 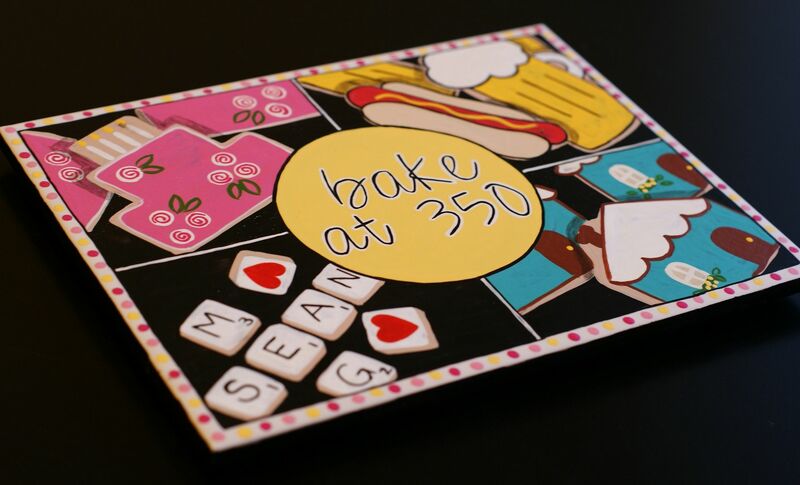 I love the 'bake at 350' tile - bc that would be inspiration at my fingertips! But I also loved the farm animal coasters and the 'let it snow' tile. I love the christmas baker! I love the bacon trivet and the cookbook crossword trivet. I like the Bakery tile...or maybe the 4 Farm Animals Tiles or the Fresh Coffee Tile...I just can't decide and I haven't even started visiting the other 2 galleries. thanks for sharing renee's site with all of us bridget! i love all of them but the winter cardinal is my fav! thanks for including me in this giveaway! I love the "Let It Snow, Man! : tile!!! If I can only pick one...I'm going with Thanksgiving Blessing, although I love them all! The "Mangeons - French Waiter" tile would go perfectly in my kitchen! Thanks for the link and the giveaway! Love Renee, she does such beautiful work! I think my favorite holiday tile is the North pole one - so cute!! I love the Sparkle Poinsettia. She is so talented! Wow... those are beautiful! I am having a tough time deciding between Christmas Kitchen Baker (of course), Oktoberfest, and Thanksgiving Blessings. I think I would choose Thanksgiving Blessings as my favorite since it's my favorite Holiday. I love the Oktoberfest one - you know my family being German and all! All the other are simply fabulous, too! Christmas Kitchen Baker would be a great gift for my mother! Love "Let it Snow" but they are all super cute! Love the Snowman tile, and the Pointsettia!! Beautiful work!!! Oooh, I love the apples, the m&m's and the pizza...and many more. Her work is amazing!!! I love love love the christmas ones!!!!! I would get the Oktoberfest for a gift. Ich liebe Oktober Fest! But I love the Christmas ones too. There is a a great step by step for the Oktober Fest mit ein bischen Deutche scattered in I loved it! So talented! Which to choose... Loved "Fresh Coffee" "Farm Animals" "Queen of Hearts" and "Bakery"
love the christmas kitchen baker tile. soo adorable! Oh my goodness. These are darling! It's between the holiday baker and the poinsettia. She's so talented! What an awesome giveaway. Love the 'Christmas Kitchen Baker' tile. So cool! I agree.. Renee's art is fantastic! I love her "Let it Snow" tile the most... The symmetry and the snowflake on the snowman's nose speaks to me! How nice of you to feature Renee's wonderful work! Let it Snow!! That is so adorable! I love the Thanksgiving Blessings, there needs to be more pretty decorations for Thanksgiving! All of her Christmas tiles are fabulous! i love the cardinal! so festive!